My watch ended at 6am and I woke John. It was his turn, but instead of going to bed, I decided to stay up and keep him company. We made coffee and did a watch together. I am very happy we like to spend time together. Being confined together in a small cabin for 15 days can be a good thing, but I can see how it can be a bit tight if you are not used to it. 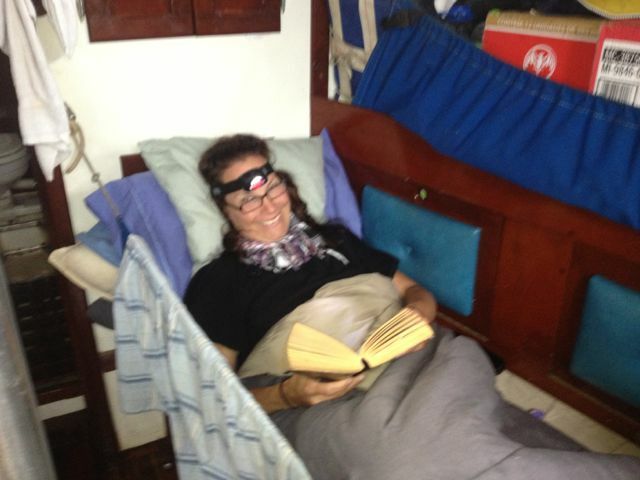 We had a long sailing day ahead of us again. 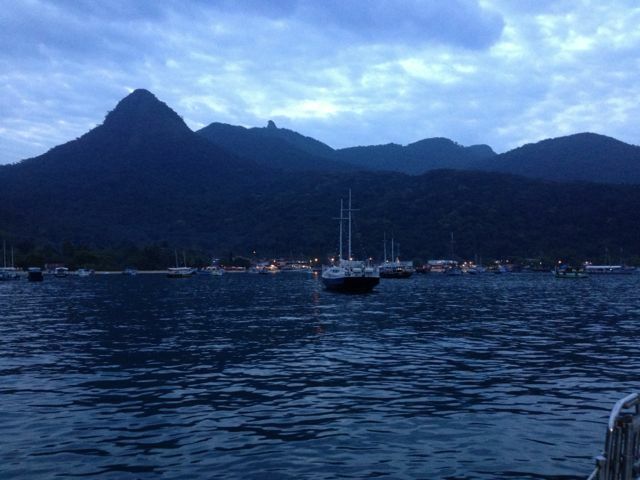 Estimated arrival at Vila de Abraao in Ilha Grande was around 6pm. Once again we motored most of the time, while having some sail up to catch the little wind there was, and to keep the boat from rolling too much. It was the busiest tanker traffic we crossed so far. This area is covered with oil rigs and oil transportation routes. 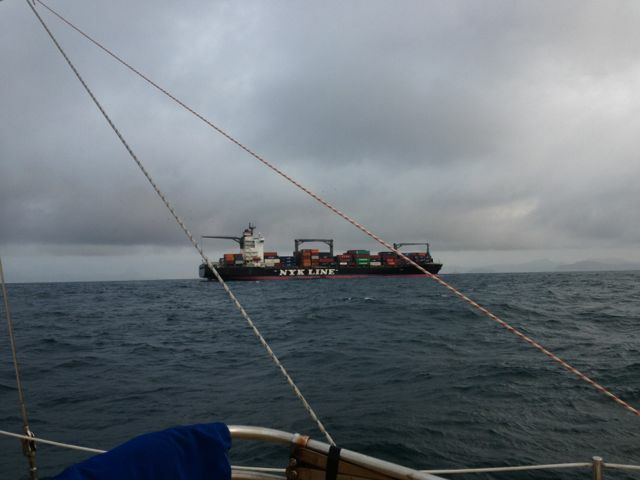 Most of the tankers were anchored, but just in case, we had to keep strict watch even during the day. The weather got better as the day went by. I finished my 620 page novel. Vila de Abraao has no dock or moorings, so we planned to anchor and take the dinghy ashore. John was all for rowing ashore, but Eric had a small, ancient, British-made motor called a Seagull he wanted to use, so he and John spent the day trying to get gas to move from it's leaky tank to the carburetor. They had the engine clamped to the boom gallows and gas leaked everywhere -- on deck, on the cover of the inflatable... what a mess. I was glad there were no smokers on board. Reading on deck... pardon my black and blue marks! There was just a bit of daylight left when we arrived on Abraao. 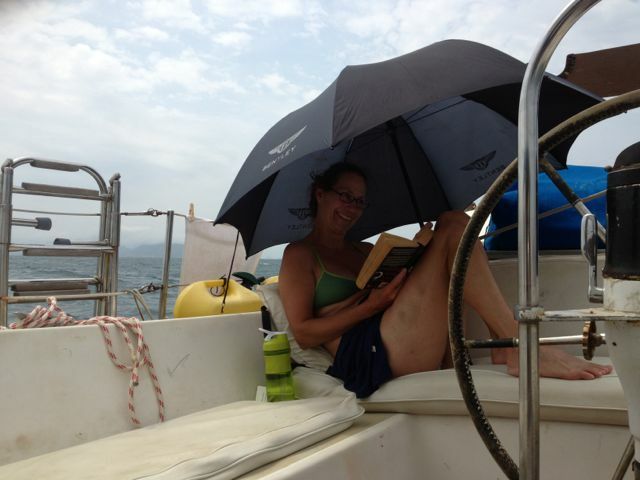 For the first time, we postponed Happy Hour until we had dinghy launched and ready to go ashore. Eric then asked us to prepare the traditional Fiona cocktails and I guess we didn’t exactly follow the Captain's recipe. Our version had more run, less apple juice, which made at least two of the ship's crew happy. 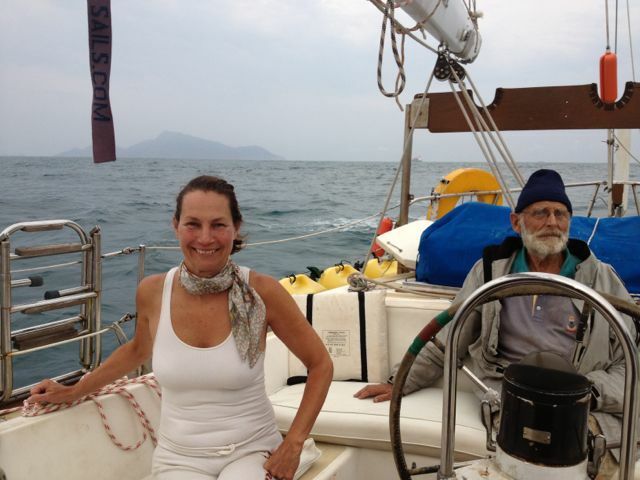 We boarded Fiona’s dinghy wearing our life jackets -- just in case -- revved up the old Seagull, and took off to the beach! Half-way there we ran out of gas. Luckily, we had oars with us. John quickly rowed us to the shore. Vila de Abraao is a very small village reachable only by boat. It’s a one mile long strip of beach surrounded by mountains and thick forests. We beached the dinghy on the left side of the town. Since it was low tide, we dragged it up onto the beach as far as we could, and started walking towards the center. Pousadas -- small quaint hotels -- and restaurants lined the shore. Most of the restaurants had tables on the beach with candles, live music, warm decorations and eager owners that invited us to dine with them. The recommended restaurant was Pe na Areia, “foot in the sand”, and once we found it, we understood why it was the number one. The candle-lit tables were laid out on the beach. The restaurant's "walls" were colorful beach umbrellas laid on their sides, lit by candles. A quietly-singing musician played Bossa Nova on his guitar. The mood created was very beachy and very, very romantic. We ordered caipirinhas, and shrimp served on a sizzling cast-iron platter, accompanied by a simple salad with tomatoes, lettuce, mangos and radishes. Very tropical and delicious and expensive. Afterwards, we set out to explore the rest of the small village, but our adventure was cut short when the Captain decided “it is late and we have to leave tomorrow morning because we must get to Santos”. Needless to say I was very disappointed. I had just started to enjoy walking in and out of little touristy shops... Oh well, the captain is the captain.